Captain Darling's extraordinary exploits and fearless feats of daring do during the Victorian Era of colonial expansion are legendary! 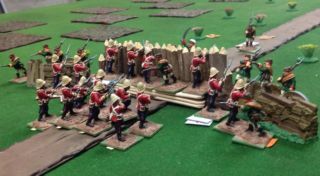 This blog interweaves his fantastic tales of adventure in an alternate late Victorian history with 28mm table top gaming. This fourth Campaign Game Scenario for my The Russians Are Coming series was played a year ago so the AAR has been a long time in the coming! 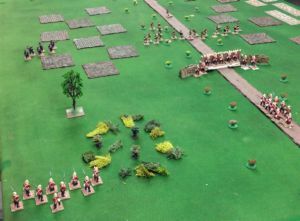 This scenario had four replays with the South Australians winning three to the Russians one. 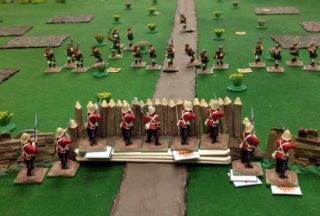 The first two saw the South Australians win comfortably and the second two where the Russian OOB was upped from four units to five saw a victory to each side. I listed the larger Russian force in the set up post as it seemed to make the game better balanced. 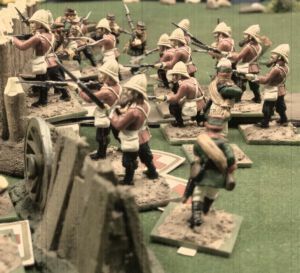 Anyway this win for the South Australian defenders puts the Campaign Game running total at three wins to the Colonials and one to the Russian Invaders. So the Ruskies have some work to do in the next three games. For this game the Russians elected to go with the Staff Officer campaign option to boost their morale and also because the chance of their Commander in Chief Lazerev suffering a heart attack grows as the campaign goes on and once that occurs this bonus is no longer available to them. 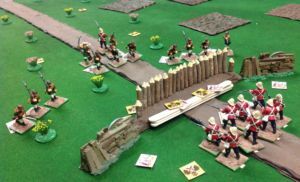 So the Russian units all gained a big advantage on their morale rolls and even when several had dwindled to half strength they soldiered valiantly on when lesser men would have turned tail and fled! As with all the games so far played in the campaign the initiative rolls are crucial and being last player in a turn and first one in the next gives your forces four actions in a row and that can be decisive, I like this as it creates some variability in the game, players will never makes the mistakes often made by leaders in the field due to FOW etc...oops I had better get off the soap box and back on track. I have selected game two of the four for the AAR as even though the Russians were a bit short on resources in this one they came very close to a win! 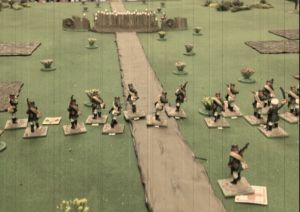 I believe the best Russians tactic is to swing a section to each flank and rush the centre with the rest of their men. 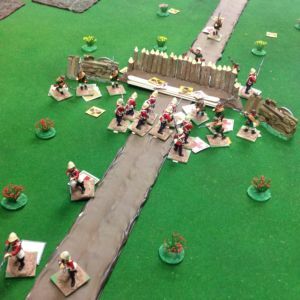 The game in which they won they used skirmish formations to close on the palisade then when close formed line and attacked, the risk of losing a full phase redeploying was offset by the extra movement each turn they were in skirmish order, while a section deployed to each flank. Charging in a column down the road to close quickly and then redeploying could be another valid tactic but not one used so far maybe a fifth game may see that. 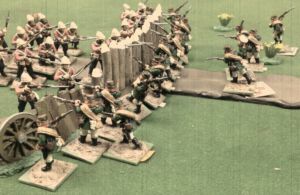 Every game we played had a melee at the palisade as the Russians with the Staff Officer morale boost were able to press home attacks despite losses and the effect of the hard cover for the defenders negated with the Russians having a trained melee level versus the Colonials Raw melee ability. A successful charge and break through was always on the cards here. Sunday August 24th was a hot day and the soldiers of the Adelaide Rifle Company were awoken by a thunderous barrage of artillery fire which to their relief it was directed not at them but far to the north around Port Adelaide. The men Sergeant Bruce's section had slept in position behind their fortifications overnight and had tea and breakfast brought up to them from the Rifle Company's bivouac. They enjoyed their repast and took up their places at the palisade in the blazing sun. They discussed what could be occurring at the Port from where the sound of battle emanated and were relieved no 'Ruskies' appeared to be interested in them. Two Privates, Rawlinson and Benjamin even played eye spy as they wiled away the time. The men became restless as the day passed and the time of their relief approached, they all anxious to get back to camp and the shade. Little did they know not far away to their north west Captain Pushkin had been made aware of their location by one of his trusty Cossack scouts and he was in process of preparing to launch an attack on them. Three of his section leaders proposed a wide flanking manoeuvre to take the South Australians in the rear but with no mounted cavalry to scout out a secure path Pushkin resorted to a frontal assault with the Cossacks making a small flanking sortie on the right. He had confidence he could better these militiamen and extolled as much to his section commanders. 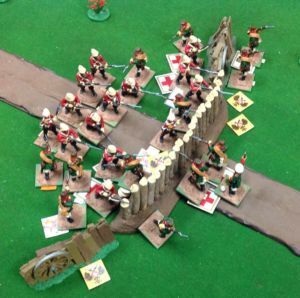 The advanced was to be in open order to minimise casualties and they would close ranks at the last moment to charge. It was just after 10:30am that Private Rawlinson said to Private Benjamin "I spy....Russians...". Benjamin said "That's not how you play the game..." He cut his sentence short as his gaze caught sight of Russian soldiers in the distance. 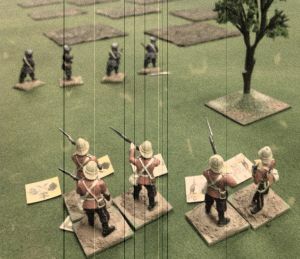 Sergeant Bruce was momentarily taken aback by the men's comments but quickly spied what they had seen and ordered the troops to stand to order which they promptly did...seconds later he roared..."Men now’s our time to be counted...pick your targets and fire at will!" The crack of Martini Henri fire started forthwith. Sergeant Nikolai Arkharov led the Siberians on the right of the skirmish line. The distant rifle fire did not concern him it resembled nothing more than fire crackers going off as the enemy redoubt loomed bigger in his eyes with every step taken. Suddenly he lurched...he had been grazed...curse the devil he thought as he reeled. He was only 'out of action' momentarily but once he recovered and looked around everyone was well ahead of him he scurried to catch up. Captain Pushkin seeing Arkharov hit moved over and took command of his section personally while cajoling everyone as the continued forward. Bruce's command cheered again and again as Russians fell from their fire but concern mounted as the enemy remorselessly approached them despite the casualties they had taken. 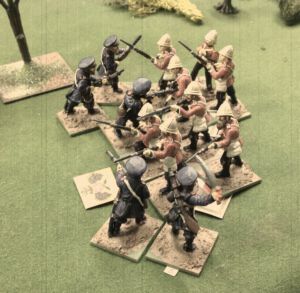 After Private Jones yelled there were Cossacks to their right and both Rawlinson and Teagle also shouted their ammunition was spent Bruce could hear fear in the voices of the South Australians. The Sergeant knew his men were wavering he could do little but act as an example, he fired like an automaton and ordered those without bullets to fix bayonets while urging the rest of the section to maintain their fire. 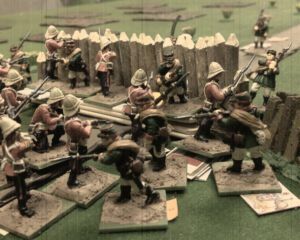 It was at this second the momentum of battle shifted, the Russian advance paused momentarily as their leaders tried to communicate to their men above the din of battle and simultaneously to their rear the South Australians heard the shouts of their fellow Riflemen coming to their assistance. Bruce enthused by these events yelled "Pour it into them lads we can't have the rest of the Company come up and steal our glory!" The lads cheered their fear evaporated in the heat of the moment and they stood firm continuing to fire at their foes without respite. The South Australians were shocked that any of the Russians could have survived the inferno of fire they had cast at them and when they emerged from the smoke and were suddenly face to face they instinctively defended themselves. The sound of battle now engulfed everyone and it was a case of every man for himself, Jones fell dead, a Russian NCO was suddenly on the Australian side of the palisade and Sergeant Bruce put paid to him using his rifle as a club, Private Teagle fell...then suddenly Russians were to the flanks of the South Australians, they were working their way around the palisade! Bruce continued to inspire his men to hold the Russians back. Captain Pushkin saw his men climbing over and dashing around the redoubt and he roared encouragement to his troops urging them on again and again while firing his revolver and waving his sword frantically. From his view the battle was as good as won! 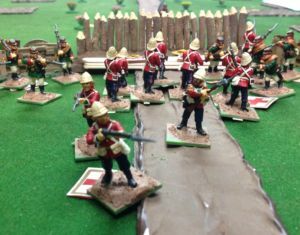 Sergeant Abbott brought his section up behind Bruce's and formed a line, he watched in horror as the melee continued between the Russians and Bruce's men but held his unit back for fear they may be engulfed too. He steadied them and kept them at the ready, if the Russians broke through they would act. Almost as an aside to battle raging around Stanley's Redoubt there was a separate action taking place at a small rise covered with dense scrub and dominated by a single pine tree to the left of the palisade. Captain Scullin believed this rise was where a group of Russian Cossacks were headed so he commanded his men, "We must stop those Cossacks boys, head for the Lone Pine we'll make our stand there!” and so it was Scullin’s men met the Cossacks at 'Lone Pine' and after a brief melee and a few casualties on each side Cossacks retired. Meanwhile back at "Stanley's Redoubt" the battle reached its climax, Pushkin's men were close to victory and he believed it was within his grasp. Then Bruce's command broke and routed the three survivors bolted and Private Rawlinson was taken prisoner...the Russians cheered and flushed with success moved forward and were met with a volley of fire from Abbott's fresh men...the Russians tried a final lunge forward urged on by their surviving leaders but they'd shot their bolt...with more than half their number dead or wounded they faltered and fell back. Pushkin knew his men were done and he ordered them to retire which they did in good order taking their prisoner with them. 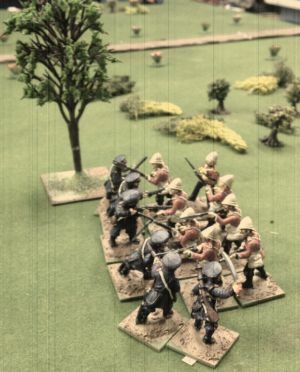 A short yet vicious melee broke out at a place known to the South Australian's as Lone Pine, casualties were light on both sides but importantly the Cossacks were defeated quickly in the words of Captain Scullin, "We sent them off In short order!" The newspaper caption to the below photograph was, "Take that yer hairy Cossacks!" Next up Scenario Five, this one puts everyone under pressure in a 'meeting engagement'. 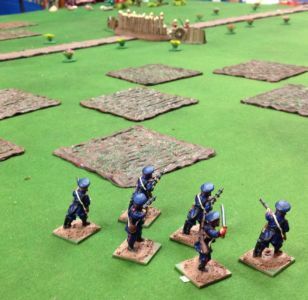 Everyone will be trying to secure a salient terrain position to gain victory with the bonus that gaining victory in Scenario Five sees your forces in comfortable defensive position for Scenario Six so the win is crucial! Top show old bean! That'll teach those Ruskies! Stirling men in the Adelaide Rifles! Great AAR. Looks like the Russian C in C will certainly get some chest pains reading the Captain's report. 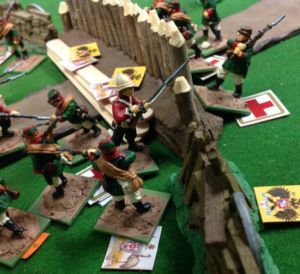 General Lazerev 'passed' the heart attack test so the Russian Staff officer may yet appear again...he may even face off against Captain Darling! Great campaign, Sterling work! I used to follow the yahoo group and your games years ago. I’m glad I found them again. Ah Sgt Guinness, thanks for looking. Good news I have the AAR next for the ‘Hills are for Heroes’ scenario sitting on my PC and plan on running scenarios six and seven of the campaign over the upcoming Christmas break! I’ve been distracted with the TSOG Blog of late! Birth of the Steam Powered Landship! A Very British Landship - The Arms Race Begins! The Evil Genius's New Lair! - Doktor Von Hades Discrete Retreat! 1/56 VSF 'Zeppelin' Bomber Build - Part Two Completed!